Being bullied as a kid is no fun, it can have severe drawbacks on the mind leading to various perceptions about the world which may be completely wrong. A certain set of people shouldn't be responsible for someone undergoing the mental turbulence, there should be peace, both at a physical and mental level for someone to live and experience the life as it should be. In the growing up years, compassion is what one looks for as a companion and not the bullies to orbit around you. In the quest to outwit these bullies, one always goes to the extremes of proving and conquering or be disheartened and give up. During this transformation of getting acquainted with such bullies, one needs support. What and how is for the one being bullied to discover. I recently read When Arya Fell Through The Fault, a book by author Reenita Malhotra Hora. Reenita is an award winning broadcast journalist Ayurveda clinician and author of multiple books on Ayurveda and Finance. She is a Mumbai native, currently residing in Hong Kong, where she anchors a popular morning finance program, Money for Nothing on RTHK Radio 3. Her book, When Arya Fell Through The Fault is about the protagonist 'Arya' who is bullied in the school because of ethnic reasons and is never considered a part of the cool group. The story is about his liking towards the Indian Epic Ramayan, because of his mother, and how he lives through it. It is also about various battles that Arya, as a kid, goes through and battles to survive. The story of When Arya Fell Through The Fault starts with his bullied childhood and how he is fed up of it. The bullying is because of the ethnic differences and also the Indian food given by his mother, in Tiffin, prepared in a Vedic way to nurture health in totality. The story is set in San Francisco, where his parents are settled to earn their livelihood. Arya has grown up listening to the tales of Lord Ram from his mother, who could describe almost every story with minute details in an animated way. Being annoyed of the daily bullying, Arya decides to be a part of the cool gang and to be part he is assigned a task of 'stealing' to prove his intent, which after several attempts he does. 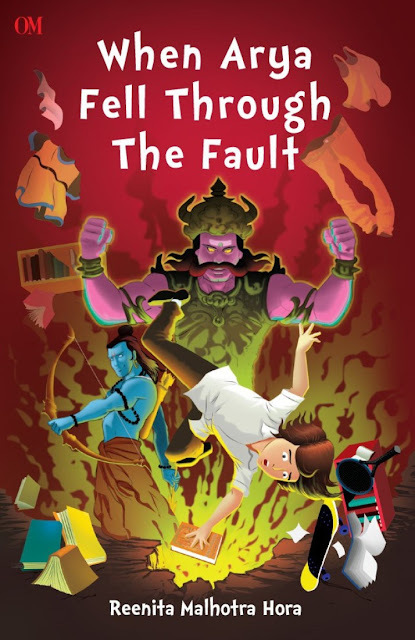 His life takes a turn and one fine day, his mother meets with an accident which turns his life upside down and in the quest to make sure that his mother is normal again he seeks support from the stories of Ramayan that his mother narrated to him. Then, there is a twist! He lives those stories, fighting with the good to win over evil, but does he manage to save his mother? That is for you to read.